Addressing some 15,000 partners at Microsoft’s Worldwide Partner Conference, Satya Nadella said he aims to bring the company past its software roots and establish dominance in a cloud and mobile world where lines between work and personal computing continue to disappear. WASHINGTON – Satya Nadella is talking a lot about convergence these days. The recently installed CEO of Microsoft, a veteran of more than two decades with the company, took to the stage at the Worldwide Partner Conference to pitch a vision for the software stalwart turning a corner, repositioning itself around the cloud and mobile computing as the computing barriers between work and personal life dissolve. "We're building out that digital infrastructure that ties together people, their activities, their relationships, to all of the artifacts of their life – be they photos or documents and more. That's what digital work and life experiences mean," Nadella says. "We're going to do the best job of being able to enable dual use," he says. "This entire notion that somehow I buy my device for consumption and personal use, and then I'll give up that device for work and take another device, just doesn't work. We know that. Simply saying even just BYOD is not good enough. We've got to harmonize this dual use." In that spirit, Nadella promises a brisk wave of development that aims to establish products such as Skype, Lync and OneDrive as mainstays of both the enterprise and consumer-tech space. With Skype, for instance, Microsoft demonstrated a real-time voice-translation application slated for a preview release later this year. Nadella envisions this as much an enterprise play as a nifty piece of consumer tech that builds on the company's work on speech recognition and machine learning and synthesis. "Think about Skype Translate applied to customer service," he says. "Think about Skype Translate applied in so many other contexts where human communication can be fundamentally transformed." Nadella describes the company's vision in part as building out what Microsoft is calling the cloud operating system, which aims to deliver to customers and partners an integrated stack of cloud services and applications integrating components such as Office 365, Azure and Dynamics CRM. 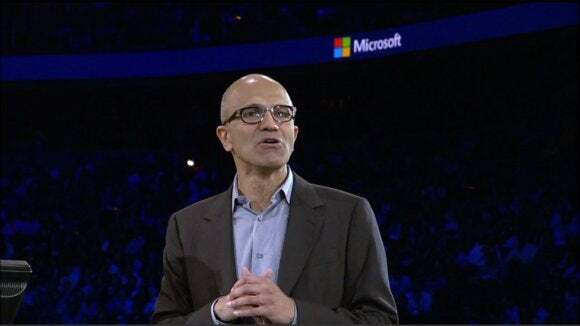 "We have an amazing opportunity ahead," Nadella told an audience of some 15,000 partners gathered in the Verizon Center for a series of keynote addresses. "We're the only company that's going to build that enterprise-grade infrastructure that meets the realities of the geopolitics of the world, the regulatory regime of the world and yet gives them the hyper-scale economics, so that means we are the company that can provide the data center backlink for all computing needs of a complex enterprise – private cloud, public cloud and hybrid cloud." Nadella's comments, and his emphasis on the importance of independent software vendors, developers and other partners, come as he has been trying to articulate a "mobile-first, cloud-first" vision for the company, while industry watchers have been anticipating major shakeups within Microsoft, including a rumored round of layoffs. Some five months into the chief executive job, Nadella circulated an all-hands memo telling employees that, "in order to accelerate our innovation, we must rediscover our soul – our unique core." Nadella added: "I consider the job before us to be bolder and more ambitious than anything we have ever done." In his Worldwide Partner Conference keynote, Nadella made a similar appeal to attendees, pledging that Microsoft understands that the dramatic redefinition of the 39-year-old company as the world's indispensable cloud platform "will only happen if we're successful at renewing our culture." "That's the hardest part, really," he adds. “The technology stuff is the simpler thing."